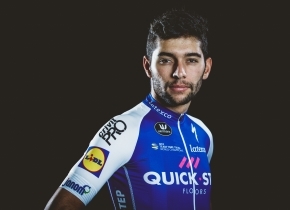 Quick-Step Floors' Fernando Gaviria has won the opening stage of the Tour de Guangxi. The Colombian was the fastest at the final sprint in the city of Beihai. The first day of the last WorldTour race of the season was 107.4 kilometres long from and to Beihai and started with a four-man breakaway that included Quick-Step's Neo-pro rider Remi Cavagna and Caja Rural's Jonathan Lastra. These four riders arrived together to the last ten kilometres, but the speed set by the sprinters' teams in the peloton sentenced the day to a final sprint. The last surviving member of the escape group was caught at five kilometres from the finish line. Gaviria showed that he maintains his good shape by crossing the line first, just ahead of LottoNL-Jumbo's Dylan Groenewegen and Bora-hansgrohe Pascal Ackermann. Max Walscheid (Sunweb) and Wouter Wippert (Cannondale-Drapac) completed the top five of the day. In 2017, the Colombian has won at least one stage in all the multi-stage races he has taken part of: The Vuelta a San Juan, the Volta ao Algarve, Tirreno-Adriatico, the Giro d'Italia and the Tour of Britain.